In Canada, the legislation that governs warranties is enforced at the provincial and territorial level. 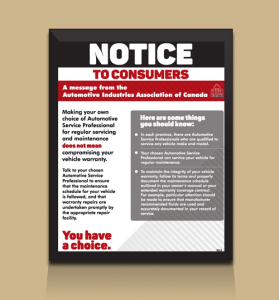 While provincial and territorial provisions may not be specific to automotive, they do provide a legal framework to guide merchants and manufacturers, and to ensure consumer protection. A FREE printable PDF version of the Notice is available for download. A permanent plaque-mounted version of the Notice is available for purchase for only $24.99 (plus tax and shipping). A brandable version (with your logo and shop information) of the plaque is also available as a special order for $49.99. The plaque measures 8.5 x 11. Please visit www.aiacanada.com and fill out an order form and we will contact you to arrange for payment and shipping.